Oh the weather outside is frightful – but this SOUP is so delightful! I’ve repeatedly expressed my deep love for all things soup before, so here is another Paleo-Friendly recipe that is quick, easy, and most importantly uses my Vitamix (aka my new favorite toy!). If you don’t have one, fret not, an immersion blender or a good old-fashioned blender will do the trick. Read on for the back-story on this deliciousness!Before I get into the recipe, let me tell you this soup is cheap and easy! Frozen veggies and some homemade stock will save even more money for you! 🙂 Now, let’s get to it! Gather your ingredients: frozen veggies, chicken stock, butter (or ghee), onion, garlic, ground beef, green onions or chives, garlic salt, pepper, and sea salt. 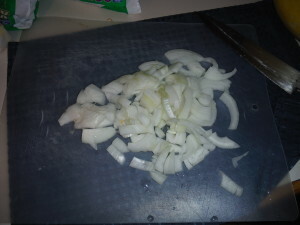 Begin by roughly chopping the onions and garlic. 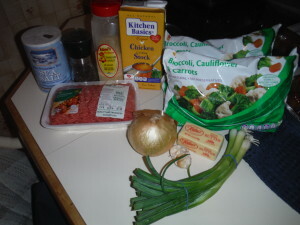 This soup will be blended so, neatness doesn’t really count. Melt down the butter or ghee in a large soup pot. 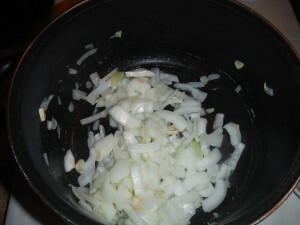 Saute the onions and garlic until soft. Be sure to stir constantly. We want the veggies to soften and flavor the pot, not burn! Add in all the frozen veggies and chicken stock. Bring to a boil. Yes, that is indeed a chunk of ice in the background. I used some homemade chicken stock that I forgot to thaw. Lesson of the day? Thaw your chicken stock or it will take FOREVER to bring everything to a boil. Bad enough the veggies are frozen – we don’t need to add a frozen brick of chicken stock too. Meanwhile, as all of you smart people are bringing your veggies and defrosted chicken broth to a boil, chop up about 4-5 green onions or chives. Add butter, ghee, oil, or fat of your choice to a frying pan over medium heat. 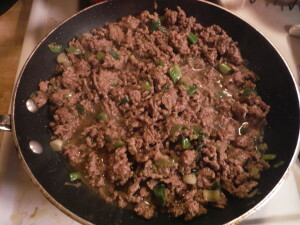 Add the ground beef and green onions and cook until the meat has browned. This will serve as the topping for our soup. You could just add this to the mix after the soup is pureed, but it makes a nice condiment/garnish. You could either drain the fat, or just keep it – it’s good for you and will add a nice flavor to the soup! Once the vegetables have softened, carefully pour the soup into a blender (Vitamix – swoon) and blend until creamy. This made quite a bit of soup, so I had to blend it in two batches. The consistency of this soup is a little on the thicker side, more of a purée, but it makes for a filling workweek lunch. 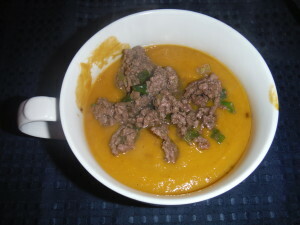 Serve warm and top with the ground beef. This reheats well in the microwave and travels well as long as you have a good container. Mine leaked all over my lunch bag the first day and I was not a happy camper. Also, this recipe makes a LOT. If you are cooking for one, cut the recipe in half and it will still last you all week! It also freezes incredibly well, so fear not if you have too much left over. Thanks for dropping by and have a beautiful day! Remember: the key to a good day is to give gratitude and stay positive! Aloha! 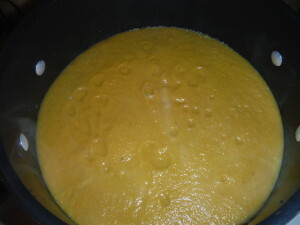 Melt the butter or ghee in a large soup pot over medium heat. Saute the onions and garlic until soft. Season with S&P. Add frozen veggies and chicken stock. Season with S&P and bring to a boil over high heat. 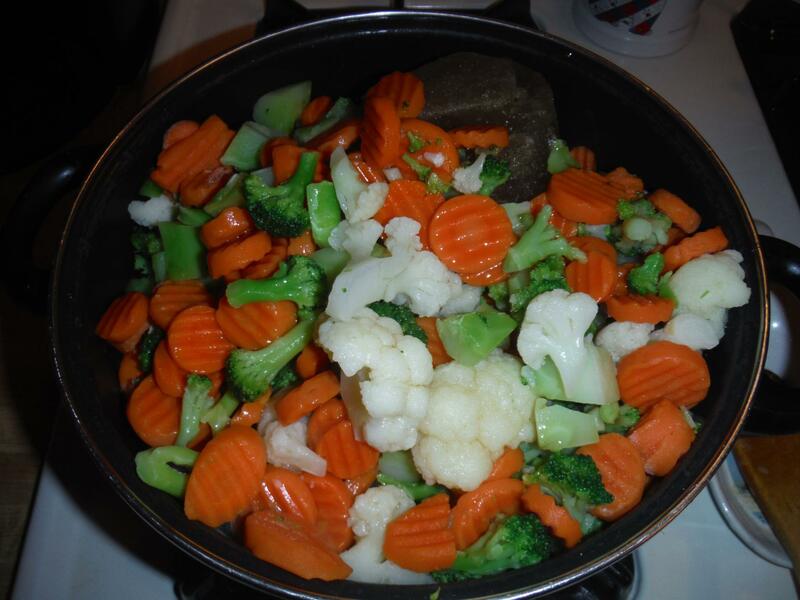 Once boiling, cover veggies and simmer on medium heat for about 30 minutes or until tender. 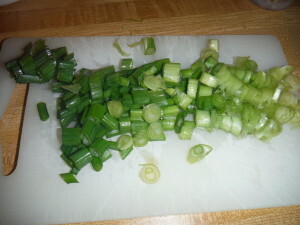 As the veggies cook, chop green onions. Melt the fat of your choice over medium heat. 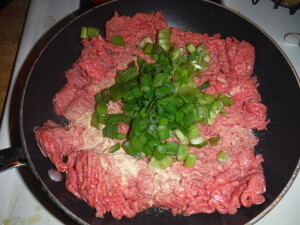 Add the ground beef and green onions and cook until browned. Set aside. 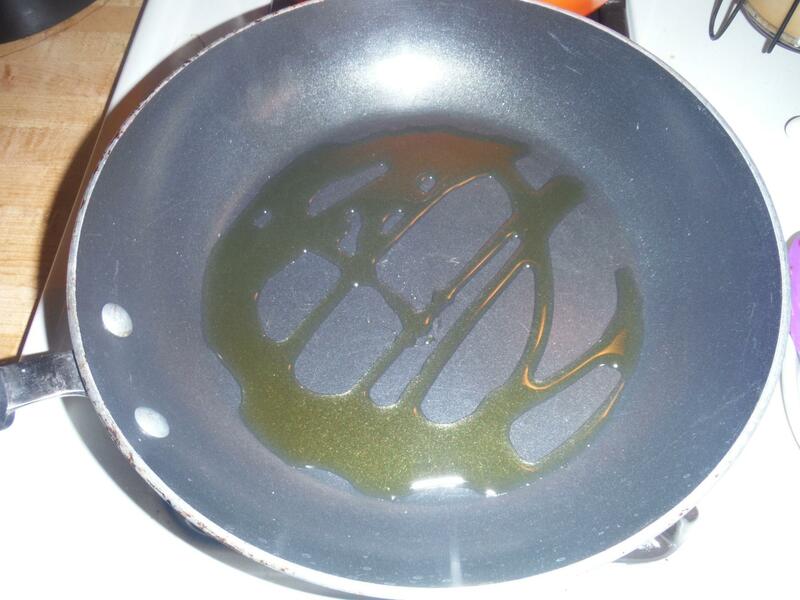 Drain the fat if that's your thing, or leave it there to savor the flavor! 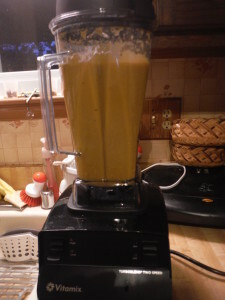 Carefully pour the soup into a blender (or Vitamix, swoon :D) and blend until smooth. This makes a ton of soup, so it might take you 2-3 batches to get it all done. Serve warm and garnish with ground beef. Enjoy!